A couple of geezers chanced to meet along Pine Creek, south of Slate Run, Pennsylvania. One of those weary fellows was me. I had just finished hiking into the Wolf Run Wild Area (aka the Wolf Run Wilderness), and the fellow I spoke with had just finished cycling another segment of the 60-mile bike trail along the Pine Creek Valley. Part of our conversation centered on my description of the Bob Webber Trail which goes up the mountainside and ends at Wolf Bald Vista. The biker claimed to like the hiking trails around here and even hoped to learn how to fly fish as he closed in on the age of 70. “Well, for rattlesnakes and… stuff,” he answered. I told my partner in dialogue that I respect the timber rattlesnake and keep an eye out for it when I’m hiking or fishing in its territory, and I reminded him that the snake is, in fact, protected by law in Pennsylvania. It’s never caused me any trouble. It was no reason to carry a gun at my side, or even a can of “snake repellent,” if such a thing existed. I had enough things to carry on this short (3.5 miles round trip) but arduous climb: binoculars, camera, lunch, and water, plus walking stick. Anything more seemed ludicrous. I had Bob Webber to thank for this trail into the wild. 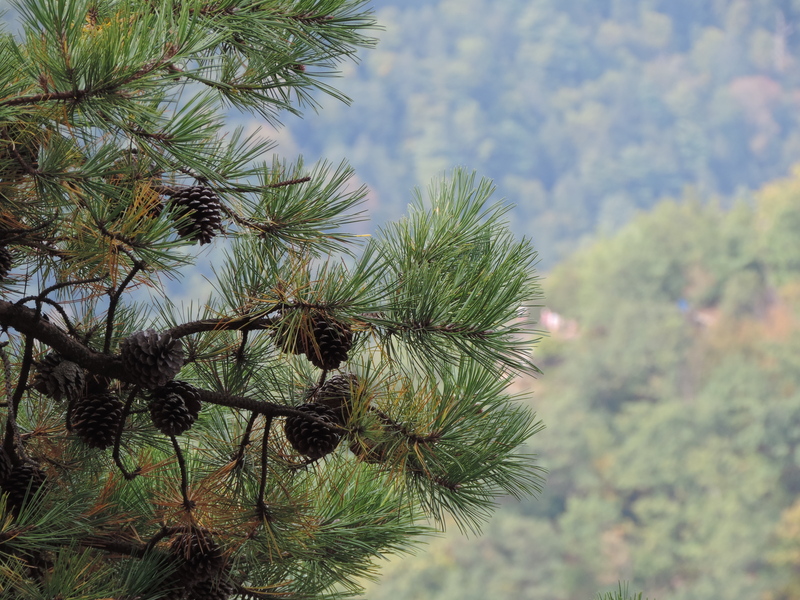 The legendary forester had lived off the grid for 50-some years in a simple cabin that he’d built nearby, without plumbing or electric, but he and his wife, Dotty, loved the simple life, the Pine Creek Valley and the wooded mountains. And they wanted others to enjoy the beauty of these mountains, too. 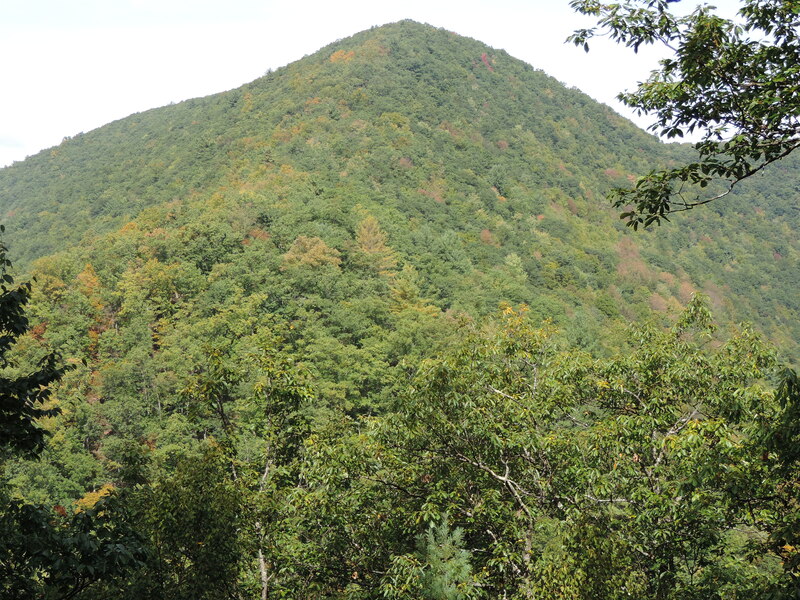 The Webbers had entertained many friends who hiked to their mountaintop cabin, and for many years, Bob developed and maintained hiking trails in the region. He built these trails on public lands with just an axe, and cared for them till his death, earlier this year, at the age of 8o. 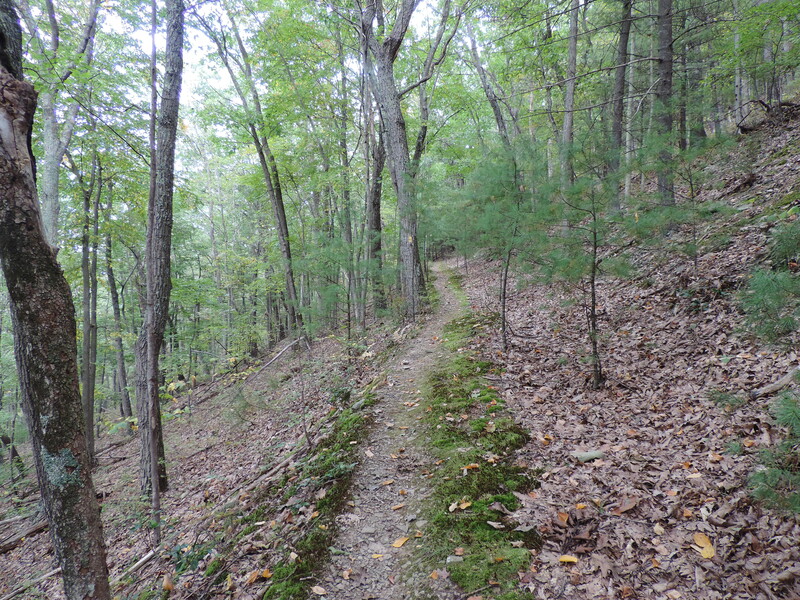 There was this trail to the Wolf Run overlook, as well as the neighboring Golden Eagle Trail (9.5 miles), and the well-known Black Forest Trail (42 miles) that circuits the mountains and valleys near Slate Run. My old legs, conditioned by running and by hopping rocks along the trout streams, felt the strain of the Webber Trail that switchbacked up the steep mountain toward Wolf Bald Vista. The ascent reminded me of the Dog Canyon Trail in southern New Mexico, except that here one climbed through a lush pine and oak forest rather than scrambling over rock and desert soil. It was steep, for sure. Chipmunks chattered; acorns dropped noisily to the forest floor; turkeys scratched for mast. A pile of fresh bear droppings waited on the trail for some drowsy flatlander to smooth it out like mud. Luckily, I stayed awake, eager for whatever moment might arrive. My shoes stayed dry and clean, and I’d see no one else on this trail today. After a rigorous 90 minute climb, I found the vista and the trail’s end. The view across Wolf Run, across the Golden Eagle Trail on the opposite ridge, and out across the Pine Creek Valley to the hills beyond was wonderful. I ate my lunch on a log seat and watched the monarch butterflies migrating southward past my lookout like slow-motion bats in the sun. 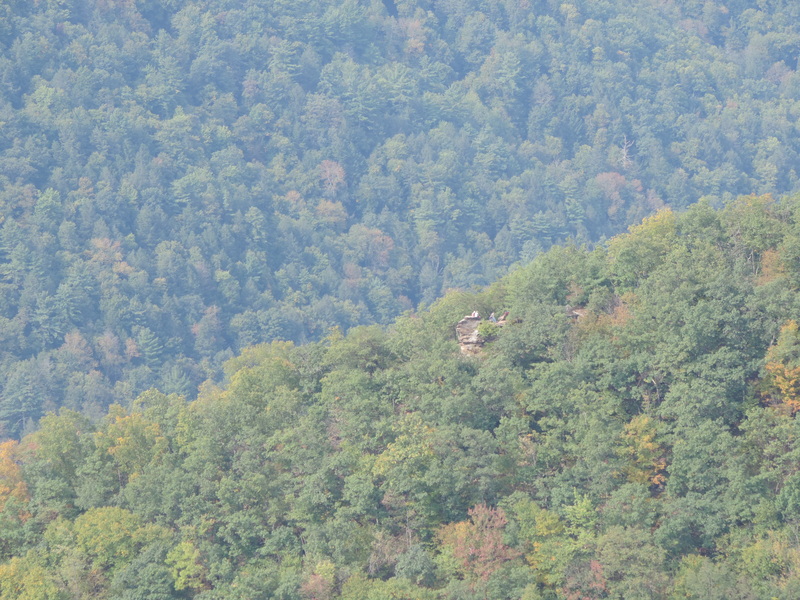 Across Wolf Run I could see the iconic outcrop called the Ravenshorn. 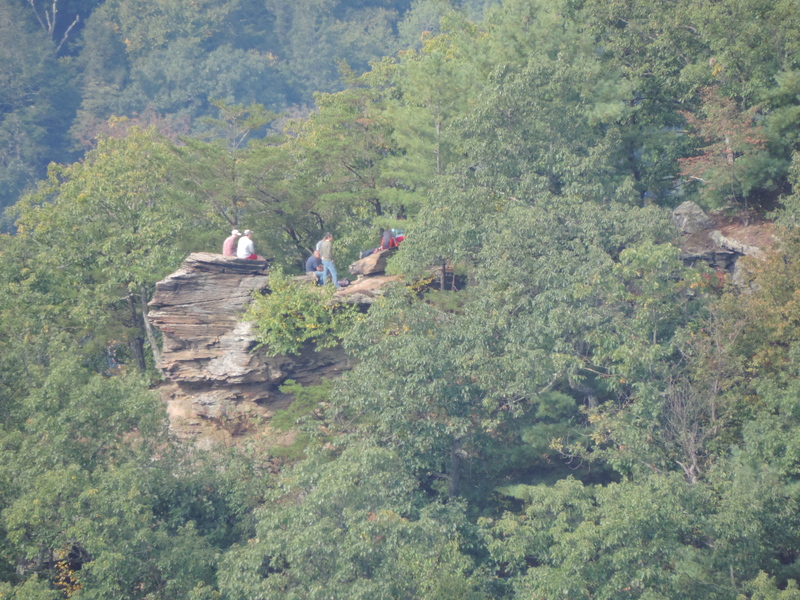 The giant rock can be reached along the Golden Eagle Trail. 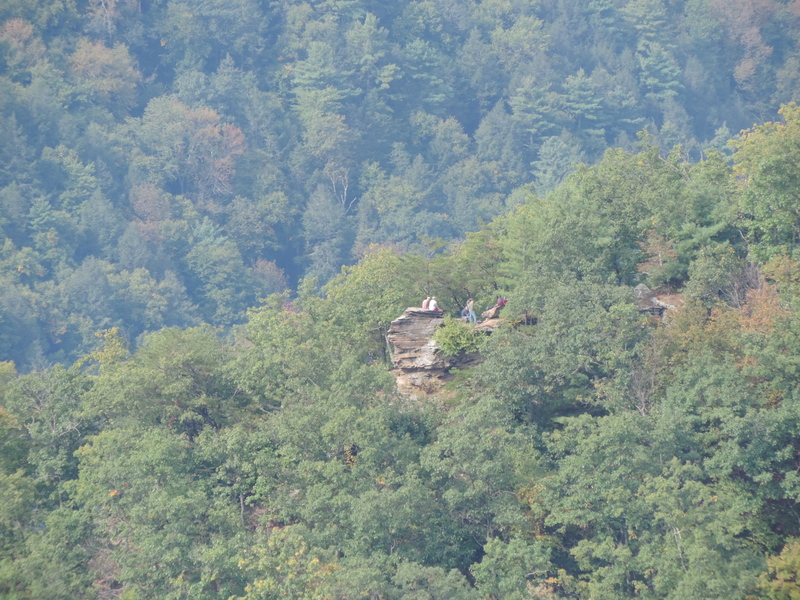 A group of hikers was on the rock. [Note the series of photographs that close in on the group]. I could hear the hikers throwing stones and chattering in what might have been the English language. They didn’t appear to be representatives of a terrorist nation. Through binoculars, they didn’t look like U.S. government officials searching for me in advance of drones and helicopters. I didn’t need a pistol or a semi-automatic to defend myself heroically against some mutant army. No sir. I was more intrigued by the fact that Ravenshorn is named for the roost it gives to one of my favorite birds. I was more intrigued by the fact that the outcrop is a home for protected rattlesnakes that live among the crevices. Back in the 1970s, some members of a state hiking club were resting on Ravenshorn while studying the outcrop on the slope across Wolf Run. Someone would suggest to Bob Webber, the veteran mountaineer, that there ought to be a trail to that point. Bob was the kind of fellow who took the hiker’s suggestion to heart. And yes, he built the trail to this outcrop where I ate my lunch and watched the butterflies. 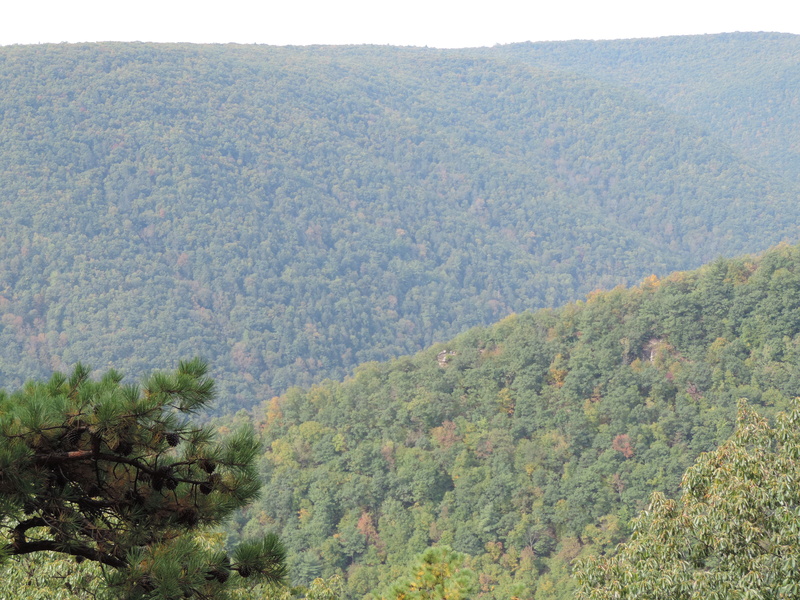 Bob had wanted to name the trail the Wolf Bald Vista Trail, but the state of Pennsylvania named it otherwise, in honor of this woodsman whose skills and love of nature had become well-known across the region. Looking across the hills and valleys was like looking into a wild mirror. Here I was, and here we were, with nature, infinite and unfettered. The only obstacle I could see was the enemy within… My thoughts– when they get in the way of things and fog up the view. If I get lucky, there are ways to clear those thoughts, to see things as they really are. Unless I was hunting here in season, I wouldn’t need a gun to clear the route. Not when I had trout streams to fish in and trails to explore. Not here in the Wolf Run Wild Area, or in any wild place in the eastern U.S. This entry was posted in Uncategorized and tagged beauty, Bob Webber, Bob Webber Trail, defense, Golden Eagle Trail, guns, hiking, humor, monarch butterflies, mountains, nature, PA trails, photography, Pine Creek, rattlesnakes, Ravenshorn, wilderness, Wolf Run Wild Area. Bookmark the permalink. It’s easy after reading that you are indeed a true lover of nature and history. I’m glad for that. Much appreciated, Howard. From the time that I was knee-high to a chipmunk I’ve been obsessed with the outdoors. Started out with birds in first or second grade, went to rocks & minerals & astronomy, to fish and everything else outdoors as the years passed by. When I grow up I want to be a writer. Btw, enjoyed your blogging packet! Thanks, Walt and I’m enjoying your book as well. I’ll need to order another one soon. The new book covers a lot more ground and might be interesting to those living in CO and mountain regions (as well as other places). Thanks so much for your support! 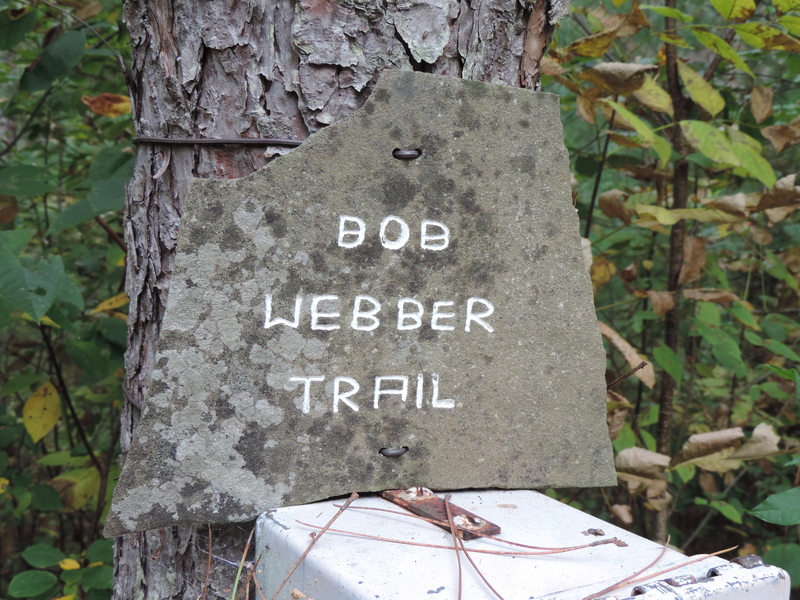 What a pleasure to have learned a little about Bob Webber – it seems he was a fine person indeed, and if he was too modest to have a trail named after him, happy to read others did it anyway. Enjoyed reading about him here. Now, gun-toting cyclists, pedalling in fear of their lives, not too sure about that…you get to meet interesting folks on the trails, but I’d rather they weren’t armed. I think maybe you disarmed with dialogue the chap you met out there. I hope so! Beautiful photographs here – those woodlands are quite something. Happy that you enjoyed this, Plaid, and find Webber to be an interesting character. I never had the pleasure of meeting him, myself, but the word I get (from hearing of him for years) from Slate Run regulars and from PA newspapers is that he was simply amazing. His list of outdoor feats and services for others is staggering. As for the biker, well, I found him interesting for his proclaimed fascination for all things outdoors, but one, like a lot of us, who is burdened for fear, especially of things not well understood. 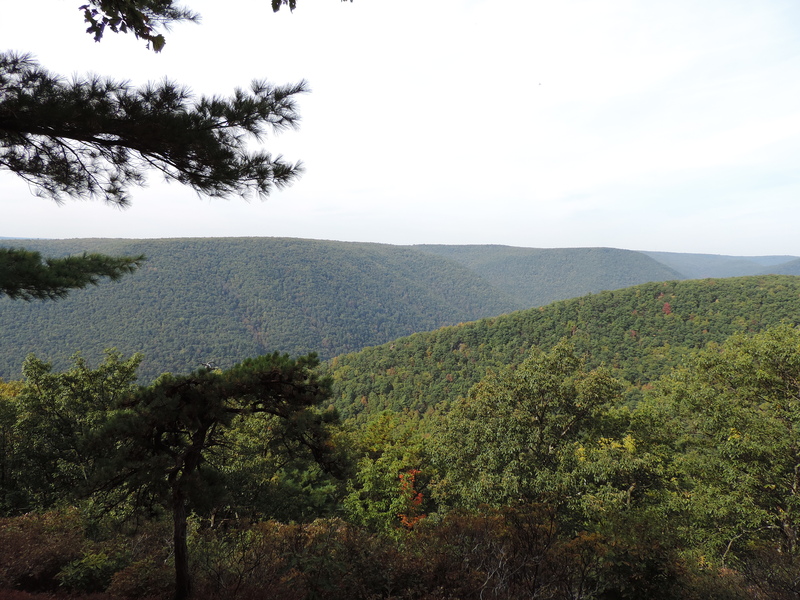 Beautiful views, and a thoughtful reflection on the spirit of a conservationist and indeed the wild areas of Pennsylvania. Not to pile onto the fellow you met along the way, but you might as well take along some Agent Orange to deal with poison ivy as pack heat to fend off rattlesnakes! Thanks Brent! The views should be getting even better there over the next couple of weeks, if this rain that’s falling doesn’t douse the immanent fire of the leaves. Agent Orange would do the trick for a lot of our ills, wouldn’t it. As for poison ivy (which I didn’t see), I’ll leave it to you to invent a good repellent for your nemesis. Flame thrower? Thanks for the history of the trails up in that beautifully rugged country. It brings back fond memories of hiking the black forest trail many, many, years ago. Hope the new book does well! Thanks Mark, and I’m pleased to have refreshed some old memories of the Black Forest Trail. It’s a fine one, and was built by Webber, by hand. Walt, I wasn’t aware that Bob Webber built that trail. From the little I read, he sounds like quite a man. Did you ever meet him or stop by his cabin? Is the state still considering preserving it or burning it down like he wished? Thanks again for the historical information! Mark, The way I understand it, Webber built the trail but had some help with it at times. I never had the chance to meet him or even to see his cabin, though I’ve heard from plenty of folks who knew him or were led on trail hikes by him. A remarkable individual, indeed. As of last month, I heard that the cabin still remains but is not in good condition. It’ll be interesting to see what happens to it ( a photo can be observed online). I agree, Kevin, there’s no need for a gun to defend yourself in snake country. It’s better to use common sense and to be careful. Hornets and wasps can spell trouble because they’re small and you can run into them before you know what’s happening. If I was a hornet I’d be mean as hell, too, especially if someone stomped on my house. So yeah, thank you! I’ve read that, too, Bob. And doesn’t that place you somewhere in that family tree? This is awesome Walt. The Stories about the trails, and Bob Webber and his wife Dotty. The photos of Wolf Run and Ravenshorn? Beautiful Like a Mayfly. I can’t wait. And well, guns. Haven’t owned one since the 70’s. In my 60’s now, it doesn’t seem like the thing to do at this point in my life. Great job. It all leaves me looking forward to your next excursion. Thanks Anonymous (Doug)! I’m with you on the gun thing. Feel like I grew out of them by the age of 20, though I’ve kept a few for nuisance control and don’t hold any grudge towards those who enjoy hunting legally. Glad you liked the photos and story of the Wolf Run area, and wish me luck as the “Mayfly” takes to the air! Phillip is my 4x or 5x Great Grandfather, I forget exactly. Got the flyer from Woodthrush Books announcing the release of “…Mayfly”, can’t wait! Bob, those are deep roots in the human history of Slate Run area. I’d like to learn more of that. That’s what fascinates me about local history. I’ve been learning the SR history slowly for the past 30 years, and still only scratching the surface. As for BLAM, thanks so much for your interest. I always feel indebted. Great story Walt. I really enjoyed it. Thanks Alan. Comments like yours make me feel the effort is worthwhile. Hi Walt ,great story and pics. Wolf run is that above cedar run? Dale, Wolf Run is south of Slate Run, about half way to Cammal, coming in from the east side. Did you notice I included your idea of “snake repellent”? Thanks! The poor misunderstood timber rattler. It has been extirpated from Maine. 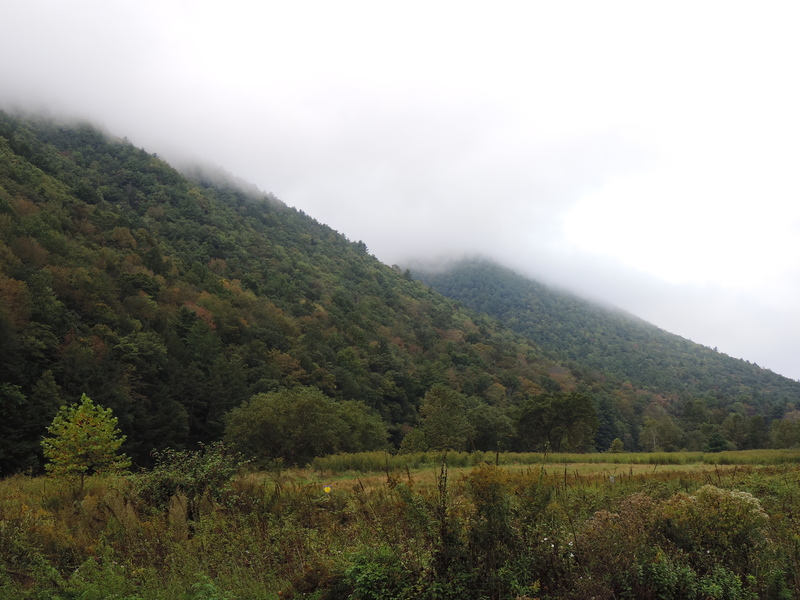 Though a small population still exists in Southern NH. many of the dens in Northern New England fell victim to destruction by progress and development, others have been wiped out by people collecting the animals as exotic pets. Late last year or early this year a Timber Rattler was found in a home in NH. The population here is less then 20 individuals and most are suffering from a type of fungi that attacks the snakes. Glad you still have them in PA and other places. Keep and preserve the wild places! Yes, keep and preserve the wild places, make them greater than they are. That is, add to them where greater size makes biological sense, and let’s heighten our respect of them. The timber rattlesnake has been victimized in many areas to the point of extinction, though in some places like northern PA the snake appears to be doing much better (there was a bounty on rattlers till the 1960s!) Thanks, Tim, for your update on its status in northern New England! This post is one of the reason I love blogging, to be able to read about the adventures of those like yourself enjoying the beauty that area has. No gym work for you the hike will work just as well. Enjoyed the post! Glad you liked it, Bill. No gym work needed for this old guy, as long as I’m willing to chase wild trout and mountain dreams. Thanks!